Will poorer families benefit from the return of Grammar Schools? On Monday the outgoing chief Ofsted inspector Sir Michael Wilshaw said, “The notion that the poor stand to benefit from the return of grammar schools strikes me as quite palpable tosh and nonsense” (gov.uk, Sept 2015). In a House of Lords debate, Lord Nash responded by saying, “there is no clear evidence to support his views” (Hansard, Sept 2015). So who is correct, Wilshaw or Nash? Every grammar school can provide anecdotal evidence of alumni who came from humble origins but went on to achieve great things thanks to the schooling they received but the real questions which need answering are, whether such opportunities are available equally to children from all socioeconomic backgrounds and whether selective admissions policies prejudice those on lower incomes. Unless it’s also being argued that there is a link between wealth and intelligence then there should be no significant difference in the socioeconomic profiles of both selective and non-selective schools. The evidence not only shows Wilshaw was completely justified in dismissing claims that grammar schools promote social mobility but also that selective admission policies, per se, appear to be incompatible with the legal requirements to ensure that admissions our publicly funded schools do not disadvantage unfairly, either directly or indirectly, a child from a particular social or racial group. Most studies use free school meals (FSM) as an indication of income however this only provides a single measurement point. Since 2008 the National Pupil Database has included a specific socio-economic indicator called the Income Deprivation Affecting Children Index (IDACI) listing the probability, ranging from 0 to 100%, that a child is living in poverty. To compare the profiles of selective and non-selective admissions policies, over half a million individual pupil records were taken from the 2014/15 census and the proportion of these falling in each 5% range of IDACI scores was calculated then plotted. 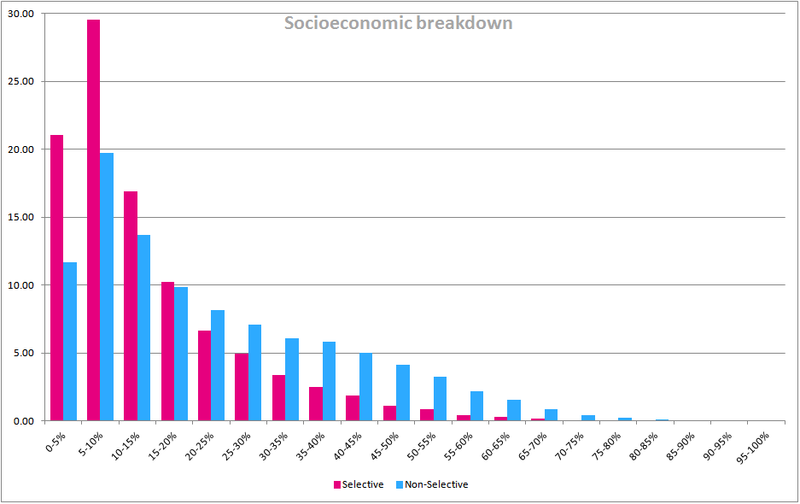 Both distributions are skewed to the right because the numbers of children decreases as poverty levels reach 100% but the grammar school values, shown in pink, are far more skewed. Selective schools admit twice as many children in the leftmost, most affluent, IDACI band when compared to non-selective schools. Wilshaw previously said grammar schools are, “stuffed full of middle class kids” (OECD 2013) and if we define middle class as those living in areas of 10% or less poverty then the graph demonstrates that this happens at the expense of those living in areas between 20 – 70% poverty where the blue, non-selective, bars are all far higher than the grammars. Selective schools don’t purposely set out to discriminate so we need to understand why their admission processes are so biased against children from poorer backgrounds. There may be a number of contributory factors such as the cost of commuting long distances or schools pressuring parents to make donations but the one factor they all have in common is children are selected through an entrance test. It’s very hard to see how a couple of hours’ of multiple choice questions can ever be capable of providing a reliable and accurate measure of an individual’s aptitude and the obvious explanation for children from wealthy families being more successful in grammar school tests is they have been tutored to pass them. For many decades the tobacco industry argued that a correlation between smoking and lung cancer didn’t prove causality. There is dearth of objective research into the effect of tutoring however the circumstantial evidence, in the form of a thriving cottage industry in tutoring, is overwhelming. Parents are clearly in no doubt whatsoever that tutoring increases the chance of their child getting a place. CEM who provide about half the 11+ tests have withdrawn promotional material suggesting their tests are resistant to tutoring and recently stated, “Without extensive and expensive research, it is not possible to quantify the impact of coaching on the results from our tests.” The test providers are best placed to carry out any research into the effects of tutoring but like the tobacco industry before them, have no incentive to undertake research which would threaten the millions of pounds they currently earn each year from administering the tests. ‘Parental Choice’ will always be the preserve of who can afford it, whether through buying a house in the right area, paying to send a child long distances to attend a school or tutoring to pass a test but the evidence here is conclusive and quantifiable; selective schools are systematically disadvantaging children who live in areas of 20% poverty and above. I am very grateful to National Pupil Database team for their help and guidance in applying to use and providing their data. The data were taken from the KS4 Pupil 2015 data linked to KS2 Autumn Census 2014/15. The Selective schools dataset consisted of 22,474 individual pupil records which matched KS4_ADMPOL=2 (selective schools). The non-selective dataset consisted of 519,521 individual pupil records which matched either KS4_ADMPOL=1 (comprehensive) or KS4_ADMPOL=3 (Secondary Modern). Of course there is a link between wealth and intelligence, not on an individual basis, but it is well established that poor post codes produce low mean CATs scores. It there to see in the CATs data for every school that has them. See my Mossbourne Academy Study in Part 4 of, 'Learning Matters'. That is why 'fair banding' driven by CATs scores is needed to prevent 'sink estates' producing 'sink schools'. It is the essential difference between Mossbournre Academy and Hackney Downs School. It is cognitive ability that counts. This can be raised by the right sort of teaching and depressed by the wrong sort (behaviourist cramming). To be specific the 'immigrant groups' perform in accordance with immigrant pupil CATs scores, which differ considerably between the groups. This is well established. Chinese and East Asian are at the top followed by Indian. At the bottom are white British and Afro-Caribbean . Are you saying there is a link between wealth and intelligence(/aptitude) or between wealth and attainment by the time children are 10 years old? The Admissions Code is clear. By law, selective schools must choose pupils based on aptitude but I fail to see how you can measure this. Any test you care to devise will reflect prior attainment. If you're saying children on lower incomes are less represented at grammar schools because their prior attainment is lower then that merely confirms that the 11+ tests are measuring attainment and not aptitude but also that the problem which really needs to be addressed is why they’ve fallen behind by the age of 10. The LAs may once have taken a more rounded view on what’s best for society as a whole but their role in admissions has been reduced to an administrative function. Academies are continually being publicly praised as “good” based on final GCSE results http://www.telegraph.co.uk/education/2016/09/08/top-10-grammar-schools-for-gcse-results2/ whilst at the same time being allowed to manipulate their admissions policies any way they can to ensure they get these results. The outcome is entirely predictable! Wherever you look, “parental choice” is only available to those who can afford it and is secondary to the Academies’ prerogative to set admissions policies. A centralised admission system with banding would reduce these inequalities although never eliminate them (I’d guess there is more social deprivation in Cornwall than Westminster), and resources could be directed where they’re needed. There are a number of explanatory variables why schools' socioeconomic profiles to differ from the average but the one which sticks out like a sore thumb is the binary variable 'does the school set an entrance test'. As with smoking and lung cancer in the absence of research it's difficult to prove that tutoring improves 11+ test results but the blindingly obvious empirical link between 11+ success and wealth produces a pretty cast iron hypothesis that it does. James and Roger - Nick Gibb is claiming the plans for new grammars will be 'very persuasive' and he expects to win over rebel Tory MPs when the masterplan is fully revealed tomorrow. This would be laughable if it were not so serious. Thatcher's right to buy put a stop to that. Once on the 'housing ladder' the British culture is to strive to move up it. The consequence is that affluent postcodes will be populated by better educated and more highly qualified adults, whose children do better at school and who tend to have higher CATs scores. This latter is also an emprical fact. We British mistakenly tend to think that all this is normal, but that is not true. Obsession with housing as an investment to be used for 'climbing the housing ladder' or (now) to substitute for a decent pension, is very much a British obsession not shared with our European and Scandinavian neighbours - and the difference is to our loss. I fully agree with you about everything else. It is very LSN - Labour left to try to argue the case. But there is no case. Its only about May trying to appease her right wing. This is about Brexit and its a scandal our kids are being used as pawns in a game. Do contributors to this site never read Machavelli? Actually, it's been decades since I read Machiavelli. Remind me of what he said about pluralism and democratic processes. Yes I read Machiavelli (ages ago) and no I don’t think objectivity will feature any time in the debate. Wilshaw backed up his arguments with facts. Nash just turned round and said he has no evidence! As usual, it’ll be the person who shouts loudest who wins the argument. May says we already have selection by house price but instead of looking at ways to tackle this inequality uses this to justify extending, what all the evidence shows, is the single worst contributory factor. The best explanation I’ve seen for this is May has no mandate so she’s picking a right wing Tory ideology which deeply divides the party to flush out those who support her and those who don’t. Then when she gets a vote of no confidence in the Commons because she has no mandate for these changes calls an election whilst the opposition parties are still in a mess. Brexit sorted! Is that Machiavellian enough? Trevor and agov - I've never read Machiavelli so you'll need to explain any references. I've promised myself I will read it eventually but I've been saying that for years. One day, maybe... before I expire. And while everyone's arguing about grammars, other nasties can be sneaked under the radar while important issues that May should be addressing (eg NHS, shrunken defence, illegal immigration, a depleted border force, tax avoidance, crumbling infrastructure, fuel and food security....) get kicked down the road. "The descriptions within The Prince have the general theme of accepting that the aims of princes—such as glory and survival—can justify the use of immoral means to achieve those ends." "The Prince can be read as deliberately emphasizing the benefits of free republics as opposed to monarchies." Again with the double posting!!! I'll see if I can guess what I'm doing wrong! Thanks, agov. Again, I'll not try to delete one in case both disappear. The evidence is clear: selection by ability worsens the effects of socio-economic background (see my post on May and meritocracy for links). The return of grammars will not only adversely affect the poor. It will adversely affect the 75% of children, poor or not, who are not selected. On Press Review this morning, one paper's front page said independent schools expected a surge in applications from parents of non-selected children if new grammars went ahead. These parents were satisfied with state secondary education at the moment because their child could attend an all-ability comprehensive school. But if these were to become secondary moderns by default (and they would if they were creamed of high ability pupils), then they would scurry off to the private sector. The majority who couldn't afford to do so would be stuck with secondary moderns. May's idea that the old binary system would be avoided if grammars were expected to open a non-selective school (for the rejected) or sponsor a failing school is false. Spot on Janet and before these issues should be addressed the government should reform the public sector pension scheme. Senior civil servants leaving on £125k pension per year, 16,000 so called retired NHS managers on £50k per year, police superintendents on £1000 a week, CEOs of local authorities on £100k pensions plus income from the revolving door. The UK has plenty of money to waste on hyper-inflated pensions for public sector retirees. Wrong again Arthur. Public sector pensions only appear to be very generous compared with the absolutely useless products of the investment based private pension industry. I paid into the teachers pension scheme for 32 years. My employee contribution was 6% and I think the employer contribution was 11%. This too can be seen as an employee contribution in lieu of pay. These are far higher levels of contributions than apply to most private pension schemes. For most of that time the teachers' scheme was in surplus, although this is a notional concept either way as the contributions are not actually invested but 'assumed to be'. In reality like all public sector pensions the basic principle is current benefits to pensioners are paid from current contributions from employees. When 'in surplus' as the scheme was for most of my career, the government used it as 'tax income'. When pension managers calculate what is needed to balance the books it is clear that increased longevity requires an increase in employee/employer contributions and/or a reduction in benefits. However this also depends on the size of the teacher workforce and their pay levels. Most public sector pensions have suffered both. However they are still far more generous than private sector pensions based on buying an annuity from the proceeds of the investment of contributions. This is because capitalism can no longer deliver the investment returns that increase the pension pot and annuity payouts. Measures to combat global warming will (hopefully) inevitably contrain or eliminate future economic growth. Hence the government's panic in letting everybody access their pension pot as if it was just lifetime savings and spend it on what they want. This is a castrophic time bomb of pensioner poverty that will ultimately result in a huge escalation in benefit claims. Public sector pensions are the only ones that work. Even after the necessary actuarial adjustments that bring them into balance they will still be fit for purpose. Just because private sector pensions are now utterly useless is not a reason attacking public sector pension schemes. The right course of action is to extend earning related public sector pensions to everybody as with SERPS. None of this defends unjustified mega-payouts to public sector bosses. Roger - I, too, paid into the 'gold plated' teachers' pension scheme. And, as you say, it was in 'surplus' for much of the time with the surplus going to the Treasury. My Dad was a life-long Tory but this was one issue he used to get angry about. He saw it as extra tax paid by teachers which went to the public purse in exchange for a promise that pensions would be paid from the public purse. The same has happened to the Royal Mail pension scheme - the Treasury took its pension fund when it was sold off in exchange (again) for a promise that future taxpayers would pay pensions to retired postees. Private sector pension schemes - in surplus in the 80s - were once the envy of the world. But Lawson's disastrous law led to pensions schemes in surplus taking pension 'holidays' instead of allowing the surpluses to accrue, and Gordon's Grab removed the Advanced Corporation Tax (ACT). As Ros Altmann explains here, Gordon Brown is blamed for the collapse of private pension schemes but it was really the Tories who had already reduced ACT. Added to that was a collapse in share value, employers using pension funds for other purposes and benefit enhanchements which couldn't then be removed. But discussing pensions is a long way from the reintroduction of grammar schools. I can't understand why Arthur brought them up - a red herring, perhaps? I am not a professional in education, but am very interested in how we encourage a fairer society from birth. Why can we simply not have one school capable of providing the education required for all types of people in the community to promote cohesion? Subject streaming makes sense so teachers can tailor there teaching appropriately, but having separate institutions based on selection means children are physically separated based on the selection criteria. Surely the obvious result of this is social segmentation and the encouragement of behaviours by the advantaged designed to differentiate them for their benefit in future life at the cost of the others? What would have become of Helen in a secondary modern struggling for GCSE Cs to avert falling below threshold performance? 'Good' schools judged on GCSE 'C' grade exam performance would have failed to help Helen. Disidealist's post is soaked in authenticity, humanity and educational effectiveness. This is something about which the claims of the grammar school lobby reveal devasting ignorance seasoned with class - based malice. Will poor familes benefit from the 10% selection admission criterion at Will Ellis school which has been going on for years and still there under the present Chair of Governors.